Studying finance and political science increased Samantha Leenas’s interest in politics and property rights law. She became especially interested in the laws that affect the economic development of a country. During the Washington Semester Program, Leenas’s professors motivated her to conduct research that sought to clarify property rights issues in Myanmar. She wanted to fill the gap in the academic literature on this topic and to inform others about the deeply rooted problems within the Myanmar’s property rights structure. The research project she started during the Washington Semester Program opened many academic and professional doors. For example, Leenas’s research during the program provided her countless networking opportunities, and after returning to Marist College, she was even invited to share her research. 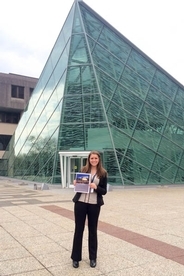 Last spring, Leenas presented her research to her peers and the Marist faculty at the Honors Program Research Forum, the Marist Celebration of Undergraduate Research Scholarship and Creative Activity (CURSCA) event, and the New York State Political Science Association’s Annual Conference at SUNY New Paltz. She recognizes that her oral and written communications skills have improved since presenting her research at these events and conferences. “My experience in the Washington Semester Program has really shaped my college experience. Participating in the program was one of the best decisions I've made,” stated Leenas. Through the continued support of American University professors, Leenas is determined to move forward with her research on the topic of property rights law. She credits the Washington Semester Program for sparking her interests. This October, Leenas will present her research at the National Collegiate Honors Council Annual Conference in Seattle, Washington.